Hours: Open daily, 8:00 a.m.--6:00 p.m. 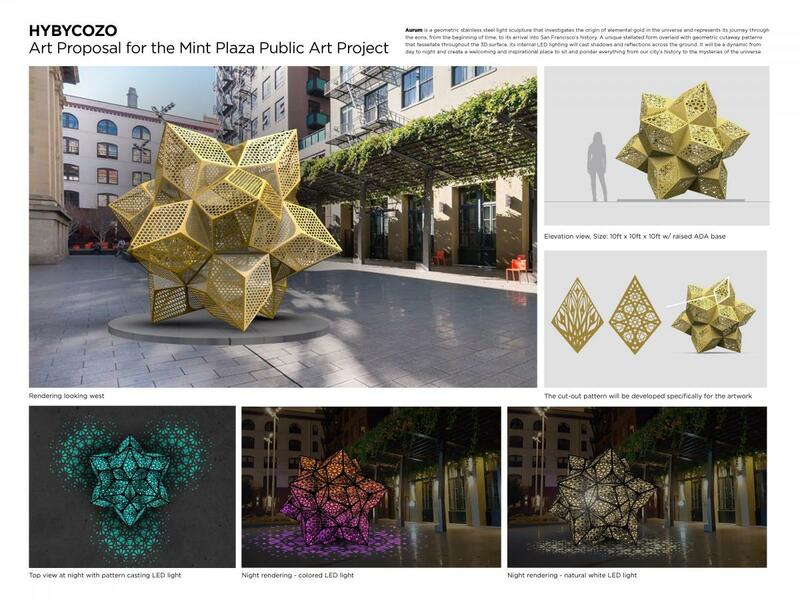 The San Francisco Arts Commission is conducting a selection process to choose an artist or artist team to create lighting or sculptural elements to be located at Mint Plaza along Jessie St. between Fifth and Mint St. The artwork is intended to activate the plaza in the evening so that the space is more welcoming to enter at night. Five artists were chosen as finalists by a Public Art Selection Panel to create site-specific proposals for this artwork opportunity: Future Cities Lab, HYBYCOZO, Haddad | Druggan, IwamotoScott, and Shan Shan Sheng. A. Concept: Since the late 1800’s San Francisco’s Old Mint has stood for stability and wealth. It once held one-third of the nation’s gold, from nuggets mined in the Sierra Mountains to bullion to minted coins distributed across the country. In reference to this history, Mirage is a dynamic and immersive artwork animated by topographic swarms of golden light and shadow. On a typical day amber layers of illumination will ebb and flow through glass diffusers, always changing and never the same. Celebrating rain and fog, moisture sensors will shift the LEDs hue to a cooler color palette of blues and whites. While the cloud-like artwork is inspired by San Francisco’s past, present and future, it is open to multiple interpretations. 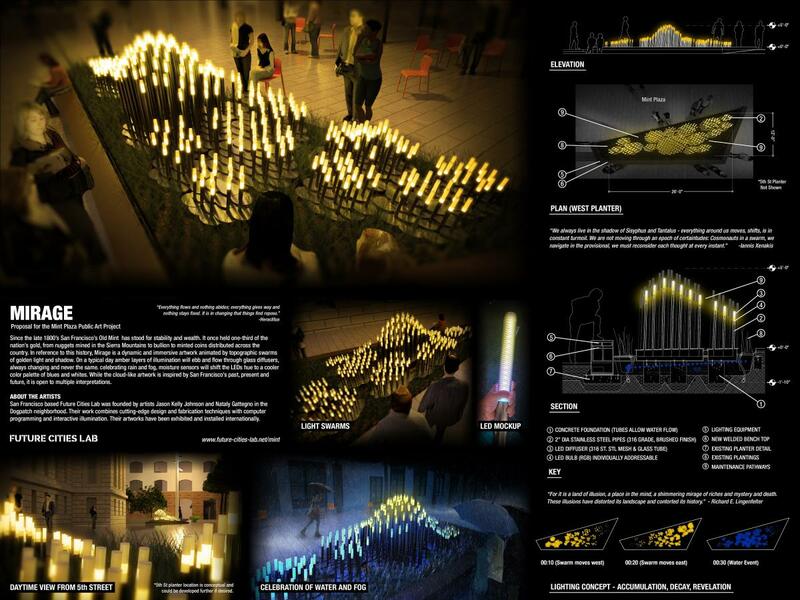 The overall lighting effects would be ambient, subtle and cascading. The “mirage” effect would be achieved by programming the illumination levels to change slowly over the course of roughly an hour or so. The programming would include a randomizing function so that clustered auroras of light would always be unique. Stainless steel diffusion meshes atop the LEDs would also allow the light to be visible day and night. B. Visual References: The artwork’s primary visual references are the flow, accumulation and dissipation of gold and water. While these connections are abstract and mirage-like, the artwork connects with the Mint’s rich history as a hub for gold collection, processing and distribution. The artwork’s topography is reminiscent of historic gold mine maps of the Sierra Mountains and perhaps stacks of coins. The artwork also connects with the Plaza’s recent redesign as a machine for water retention and bioremediation. The existing Rain Gardens are celebrated through the shift of color from warm amber to auroras of cooler blues and whites, illuminating the subtle flows of water and fog. C. Locations: The artwork is primarily located in the Mint Plaza’s west planter with the possibility of extending the artwork to the east planter near 5th Street. This will be determined by opinions of neighbors, feasibility and budget. View a larger image of the proposal. Centrally located, Golden $tate will demarcate Mint Plaza with a memorable image that symbolically ties a historic landmark to the broader identity of San Francisco and its unique shine. Growing out of the 1849 Gold Rush, San Francisco became a major city due to the discovery of gold. Throughout history, gold has represented prosperity, but also beauty, purity, generosity, and timelessness; attributes in tune with San Francisco’s culture. The San Francisco Mint was built to safely store, exchange, and mint raw gold into coinage. It survived the Great 1906 Earthquake and Fire and became a hub that allowed San Francisco’s economy to rebuild and grow. In the proposed artwork, the tiny “S” Mint Mark found on coins made at the San Francisco Mint is enlarged to a grand place-making scale. The S has a second read as $, the symbol for U.S. Dollar. The $ symbol is hypothesized by some to have begun with U.S. Mint monograms on money bags. A plaque near the art can convey these layers of meaning. Alchemically transforming the space, magical lighting effects changing from day to night and with varying sun angles, cloud cover, and fog will create an immersive art experience that unifies the space through a shared experience resonating with a wide spectrum of visitors. Golden $tate is composed of 64 faceted stainless steel spheres, each 10” in diameter. The spheres are proposed to be fabricated from 3 mm stainless steel, weighing about 10 pounds apiece. Each sphere will be faceted and then polished to a mirror finish to catch and reflect light, like a disco ball. Following polishing, the spheres will be coated with a UV-stable gold PVD (physical vapor deposition) coating that is durable in all weather conditions. Strung like giant beads onto vertical cables attached to “gold bars” at the top and bottom, the faceted spheres will together form an “S” shape based on the San Francisco Mint Mark. Two cables may also be strung with gold PVD-coated tubing to turn the S into $ at a closer view. The spheres will be attached into a frame, and then onto poles at the site, with a stainless steel cable system. Each cable will have a stainless steel turnbuckle for custom tensioning. Strung like giant beads in a loom, the faceted spheres will together form an “S” shape based on the San Francisco Mint Mark. Suspended between an existing and a new pole, the permanent banner-like sculpture could include a swivel mechanism for rotation. Hanging over the plaza, the 24’-high luminous sculpture will be very visible from a distance but also out of reach, minimizing damage and vandalism. It could be placed above or near an existing planter with integrated seating, and the existing plantings perhaps augmented with aromatic spearmint (Mentha spicata). Final location of the sculpture will be coordinated with the City, owners, and design team. Magical lighting effects changing from day to night and with varying sun angles, cloud cover, and fog will create an immersive art experience that both transforms and unifies the space through a shared experience resonating with a wide spectrum of visitors. The sculpture will act as a catalyst that scintillates golden light flecks across the plaza with the addition of bright sunlight or nighttime lighting, while in clouds and fog the luminous sculpture will radiate its own bright golden glow. While the sculpture itself is out of reach, its lighting effects will create an embodied experience at plaza level that vastly expands the scale of the artwork. LED spot lights will be mounted to existing 40’-tall light poles and/or in the landscape bed beneath the sculpture. 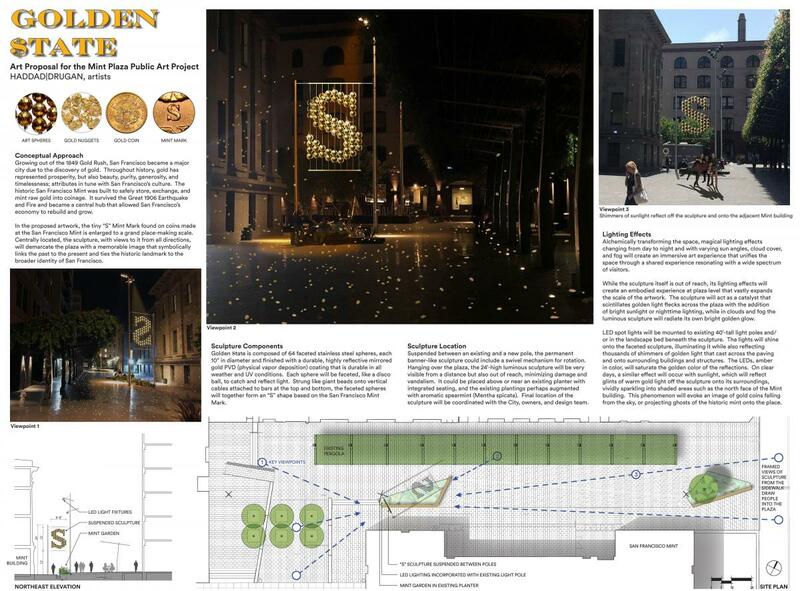 The lights will shine onto the faceted sculpture, illuminating it while also reflecting thousands of shimmers of golden light that cast across the paving and onto surrounding buildings and structures. Custom amber-colored diodes will saturate the golden color of the reflections. Rotating LEDs may also be possible, which would cause the glints of light to dance around the plaze. Durable, exterior LED fixtures will be a priority. The artists will investigate fixture types and placements, beam angles, and amber LED tones that best elicit the desired lighting effects. On clear days, a similar shimmering effect will occur with sunlight, which will reflect glints of warm gold light off the sculpture onto its surroundings, vividly sparkling into shaded areas such as the north face of the Mint building. This phenomenon will evoke an image of gold coins falling from the sky, or projecting ghosts of the historic mint onto the place. ​View a larger image of the proposal. Aurum is a geometric stainless steel light sculpture that investigates the origin of elemental gold in the universe and represents its journey through the eons, from the beginning of time, to its arrival into San Francisco’s history. A unique stellated form overlaid with geometric cutaway patterns that tessellate throughout the 3D surface, its internal LED lighting will cast shadows and reflections across the ground. It will be a dynamic from day to night and create a welcoming and inspirational place to sit and ponder everything from our city’s history to the mysteries of the universe. The SF Mint, in its granite vault, once held one-third of all the gold in the United States. The story of how it was discovered, mined in the golden foothills of California, and brought through San Francisco is a rich and colorful part of our city’s history. However, have you ever wondered how that gold actually got into the foothills? Or onto Earth for that matter? Gold, or in latin Aurum, is an element prized for its aesthetic and material features. From jewelry, to gilded crafts, to circuit boards, the use of gold coincides with the growth and development of civilization, art, and material science. However, its origin on Earth has been a mystery until quite recently. Scientists know that simple elements like oxygen, carbon, and silicon come from stars at the end of their lifespan running out of hydrogen and helium for fusion. These stars then start creating higher density atoms that explode in a supernova, eventually cooling to form smaller stars and planets, which is how the Earth was created. However, they knew it was not possible to produce heavier elements like gold and platinum in such reactions because they required with a lot more energy than is present in a supernova, so it remained a mystery until quite recently. In 2017, the Nobel Prize in physics was awarded to the scientists from LIGO, who for the first time detected gravitational waves, literally ripples in the fabric of space, caused by high energy collisions, first theorized by Einstein in 1916. What they detected was two neutron stars colliding, (for scale of a neutron star, imagine if our sun’s energy was condensed into an area the size of Manhattan) which produced a “kilonova,” an explosion many times more massive than we had ever seen before. The explosion affected the fabric of space producing gravitational waves which LIGO was able to detect for the first time. The collision of these stars also gave off gamma rays carrying a chemical signature that indicated the creation of elemental gold. Alchemy, detected for the first time! Our goal with this sculpture is to represent this story, a part San Francisco and the Mint’s history, and perhaps connect personal memories of a piece of gold jewelry a person might have worn or something that has been passed down in their family, to this highly energetic, wondrously explosive, and even extraterrestrial origin. A central goal of our practice is to to place artworks in the public sphere that can serve as a gathering place for the community while creating educational and interactive activities around them. We are starting a nonprofit called MAE (www.MathArtEducation.org) to develop publically accessible educational resources, curriculum, and field trips around public sculpture. The Mint Plaza site is exciting to us because it offers a historically significant location and an interesting narrative inspired by contemporary physics. The sculptural form is based on the first stellation of a dodecahedron which also provides an interesting activity as the shape can be drawn and folded from paper. The artwork will be a laser cut, powder-coated gold stainless steel geometric star. Mathematically, the shape is called a stellated dodecahedron with some unique modifications. Approximately 10 x 10 feet and touching the ground at 3 points, with 9 points facing out. Aesthetically the lines look sharp, however, we assure you that the ends will all be rounded to be safe for the public. The gold color will shine during the day while softly glowing and projecting shadows on the surrounding environment at night. We have perfected a custom powder coating blend for stainless steel with our supplier that is both durable and aesthetically appealing. The powder coating will also be covered with a protective UV coating that is both graffiti resistant as well as providing another layer of protection against corrosion from the elements in SF. The finish is a matte flaxen gold color. A natural looking, quiet gold, that still has a little pop while working well with the stone pallet of the plaza. A large anchor artwork in the plaza is the ideal location, but we are also open to discussing several smaller stars throughout the plaza if the committee feels like that would be best for the flow of people and events. The central form we proposed can be adaptable to a configuration of 3 smaller simpler sculptures at different stages of an exploding star. View larger image of proposal. The nature of San Francisco as a cultural space is the result of complex interactions among society, technology and economics shaping its rapid growth of urban form, constructed upon a highly particular and dynamic landscape. Its early growth was fueled by the Gold Rush, and as such, gold is a key instigator in its past. The San Francisco Mint was a key player in storing, managing, and minting this gold into currency. 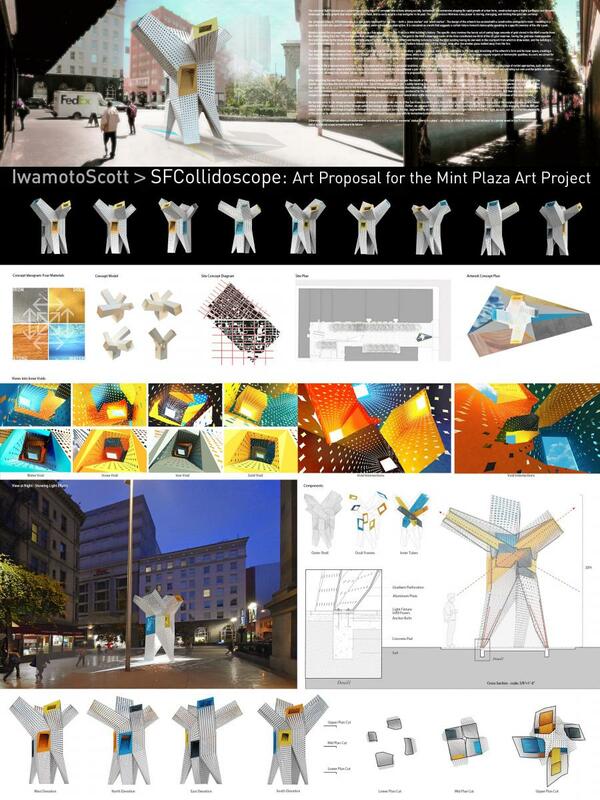 Our proposed artwork, SFCollidoscope, is a new public landmark for the City -- both a ‘place marker’ and ‘event marker’. The design of the artwork has evolved with a constructive ambiguity in mind – resulting in a piece that is both site-specific construct and imported, semi-autonomous abstraction. It is conceived as a work that suggests a certain future-forward stance while speaking to a specific memory of the city’s past. Ideation behind the proposed artwork was inspired by a key episode in the San Francisco Mint building’s history. The specific story involves the heroic act of saving huge amounts of gold stored in the Mint’s vaults from the fires resulting from the 1906 earthquake that ravaged much of San Francisco. The gold in the Mint’s basement vaults at the time constituted one third of the US gold reserves. Saving the gold was made possible first and foremost by the brave Mint workers who stayed to fight off the flames. Other contributing factors included the Mint building having its own well in the courtyard from which to draw water, and the building’s construction materials – its granite base, thick sandstone walls and cast iron window shutters helped stave off the flames, even after the window glass melted away from the fire. The dynamic interaction between four constituent materials and forces (players) in the story – gold, iron, stone, water – are abstracted in the four-way branching of the artwork’s form and its inner space, creating a four-way internal intersection of four colored tubular voids at the piece’s center. The piece, while clearly governed by underlying geometry, also conveys vaguely organic or biomorphic qualities. As such, we aimed for an artwork that might be perceived as rationally shaped and constructed, while at the same time seeming almost self-organizing, or organically grown. In arriving at the proposed artwork’s form, our team explored many different potential locations, configurations and aesthetic strategies for the piece. This included a wide range of varied approaches, such as a distributed field of smaller objects within the plaza, or a composition of and dialogue between a pair of more totemic artworks at either end of the plaza, etc. We settled on concentrating our own and the public’s attention on a singular, strategically situated, hollow, totemic sculptural artwork. The sculpture is proposed to be made from custom perforated heavy gauge aluminum plate. After observing the less than ideal condition of the existing planter, bench and tree near the mouth of the plaza at 5th Street, we propose to create a new inlay of paving material that infills the shape of the planter, and inscribes the form of a four pointed star. Out of this groundwork, grows a subtly twisting four-legged porous structure, supporting a midsection containing a void/aperture on each side. These four apertures act as oculi that lead to the four intersecting rectangular tubes within the midsection, which in turn become the involuted inner surfaces of the piece’s outward-branching top. When viewers look into the midsection’s apertures they see a complex space, almost kaleidoscopic, produced by the multi-subtractive interaction of the four tubes within the midsection. But then one also see past this complex condition into the simpler ends of the tubes, on to glimpses of facades and fenestration of the buildings that surround and define Mint Plaza, with small framed glimpses of the skies beyond. We decided early in the design process to attempt to interpret the dramatic events of the San Francisco Mint’s past, then to directly abstract this in the form and space of the sculptural piece; and to resist adding another layer of interaction through added technology applied to the piece. Rather, we propose the form and spatiality of the sculptural piece itself can become a fully engaging artwork, with an added sense of life and change brought on through the changing daylight during the day, augmented by strategically deployed internal light fixtures during the night. As such, our aim is that the physicality of the piece on its own will engender interaction through the visual/temporal play with its immediate context and the viewers perception. 'Ultimately, SFCollidoscope offers a transformative counterpoint to the familiar memorial ‘statue (hero) in a plaza’ - standing as a kind of ‘after-the-fact witness’ to a pivotal event in San Francisco’s past and a ‘sculptural scope’ aimed toward its future. Obelisk - A Free-Standing Sculpture. Like the traditional obelisks of ancient times, this new sculpture will tell the visual story of San Francisco’s history. Obelisk reflects milestones of key moments in San Francisco’s storied past by surveying a transforming landscape. 22 ft tall, has a depth of 4.5 ft and is 4.5 ft wide. As a material experience, each moment of the sculpture is an interval of luminosity and engineering. The sculpture will be presented in center of the main plaza. The composition of each glass panel is representative of the endless sky and unique, bountiful bay-area landscape. The monumental sculpture is dynamic and vibrant, activating the plaza, creating a colorful and immersive experience for the people of San Francisco. The elevated composition accentuates the plaza amongst the city's skyline. The lighting of the sculpture by night is a slow illumination, an organic gradation of light, as if the sculpture creates visual interest and a luminous icon at night. 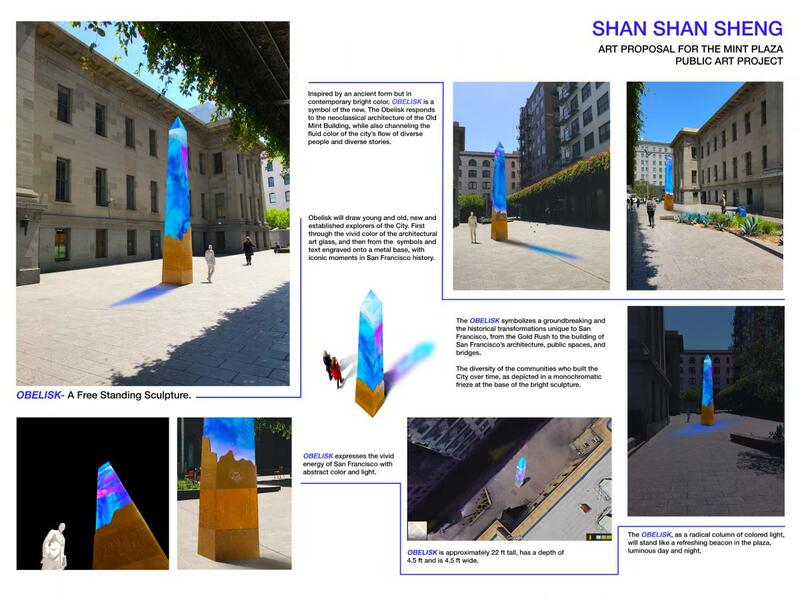 Obelisk will provide an iconic form at Mint Plaza, suggesting an awakened sense of energy, momentum, and discovery suggesting San Francisco dynamic evolution in past, present, and future. Please take a few minutes to review the proposals here and complete the comment form below. You may also email your comments to sfacpublicartcomment@sfgov.org, or hand deliver/mail comments to 401 Van Ness Avenue, Room 325 by September 24, 2018, 5 p.m. The Final Selection Panel meeting will take place on September 25, 2018, 12:30 a.m.- 5 p.m. at 401 Van Ness Avenue, Room 302. All Artist Selection Panel meetings are open to the public. An agenda for the meeting will be posted 72-hour in advance of the meeting on SFAC’s website under the Public Meeting section: www.sfartscommission.org/calendar. Will the artwork be enjoyed by people of all ages and backgrounds? How well does the proposed artwork fit into the environment? Please contact: trisha.lagasogoldberg@sfgov.org or (415) 252-2222. Materiales traducidos están disponibles para usted de manera gratuita. Para asistencia, notifique a trisha.lagasogoldberg@sfgov.org or (415) 252-2222. 我們將為閣下提供免費的書面翻譯資料。 如需協助，trisha.lagasogoldberg@sfgov.org or (415) 252-2222. Ang mga materyales na nakasalin sa ibang wika at ang mga serbisyong tagapagsalin sa wika ay walang bayad. Para sa tulong, maaring i-contact si trisha.lagasogoldberg@sfgov.org or (415) 252-2222.